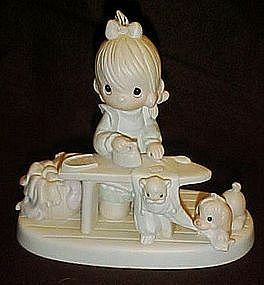 adorable enesco precious Moments figurine with the fish imprint symbol dating it as an early piece, 1983. Jonathan & David, Introduced in 1983 and discontinued in 1999. Little girl ironing and her playful puppy tugging at her pj's she's pressing. Larger piece measuring 6" tall and 6 1/4" wide. excellent condition, but no box.